Many of the more than 1 million migrants entering Europe since 2015 are refugees, particularly from Syria. But once they’ve left their life in a war zone behind, in Europe they risk becoming a slave. Risk consultancy Verisk Maplecroft released its annual report that addresses modern slavery, an umbrella term for those forced into labor, servitude, and the trafficking of people. It assesses 198 countries on their law enforcement and legal structures, effectiveness of their enforcement, and severity of violations. While North Korea, Syria, and South Sudan ranked the worst on this scale, nearly three-quarters of EU countries saw slavery risks increase over the last year. 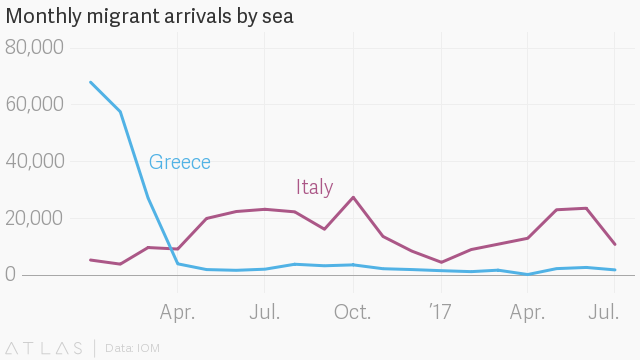 And while migrant arrivals have dropped dramatically in Greece, it remains a hub for human trafficking, the consultancy warns. “The presence of these vulnerable migrant populations in the primary countries of arrival is a key contributor for increases in slavery across multiple sectors in the region, such as agriculture, construction and services,” according to the report.